Everyone’s favorite fairy princess is back and just in time for her ballet recital. At first, when Gerry is cast as the Court Jester and not the Crystal Princess, she is dismayed — nothing is pink and no one can see her crown under her silly jester hat! 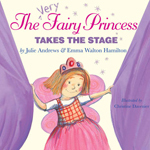 But just as the recital looks like it’s headed for disaster, our ever-energetic very fairy princess swoops in to save the day! Gerry’s sparkle radiates from the page once more through Christine Davenier’s whimsically elegant illustrations in this spirited, ballet-themed follow-up to The Very Fairy Princess.